Excellent contact terminal design makes G series circuit breaker outstanding performance and high flexibility possible.Our licensed te-chnology adopts speed ’air-blowing’ system, this system adopts high breaking capacity fault current electric Power.function. G circuit breaker adopts operation shaft equipment structer, this structer can trip freely when short circuit,shaft can direct definitely trip which caused in short circuit or overload, this fast and reliable opera-tion system improve the safety performance. G circuit breaker’s quality and reliable is assured by completely testing, each pole on circuit breaker will make 2 times setting test to assure trip structure, operation structure and continuously and precision. 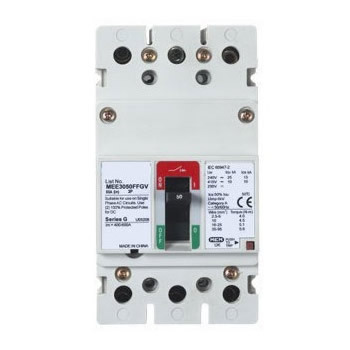 G circuit breaker adopts shaft operation feature, this shaft can instruct circuit breaker’s working condition: ON OFF and PIPPED. When circuit breaker appear overloading, short circuit, shunt or under voltage trip action, shaft will jump to TRIPPED (trip) position, at this time, if need to re-switch on must push shaft to RESET position. On both sides of shaft on EG and RG frame there will have 2 windows, which direct circuit breaker’s working condition, red, green and white each correspondence to: On/OFF/TRIPPED.